Sight words are high frequency words that need to be learned by sight. Tip #1: There is a need for better terminology and understanding. Firstly ‘sight words’ means so many things to different people. The term ‘sight words’ often provides a false impression that these commonly used words are to be learned by sight (or visual memorisation). Research does not support teaching these words as ‘visual whole units’ without attention to the phoneme-grapheme (sound to letter) correspondences. It is far more useful to view sight words are high frequency words that need to be explicitly taught so they are learned by sight. Automatic recognition of the words by ‘sight’ is the end product that is achieved through systematic and explicit teaching. Children should never be asked to memorise lists of ‘sight words’ before they have received instruction in phonological and phonemic awareness, letter-sound correspondences and blending and segmenting, and have at least started to apply decoding skills to convert written symbols to spoken sounds. Tip # 3: Teach from simple to progressively more complex. Introduce the short regular words initially, and work through to the more complex. Tip # 4: Group similar high frequency words together – (for example: do/to/who, be/he/me/she, how/now/down or with/this/then/them/than). This is where the boundary for teaching sight words or phonics becomes unclear, because by focusing on these high frequency words, phonics is also being instructed. Tip # 5: Integrate sight word teaching within a structured synthetic phonics (SSP) program. Teach explicitly, systematically and within your SSP program. 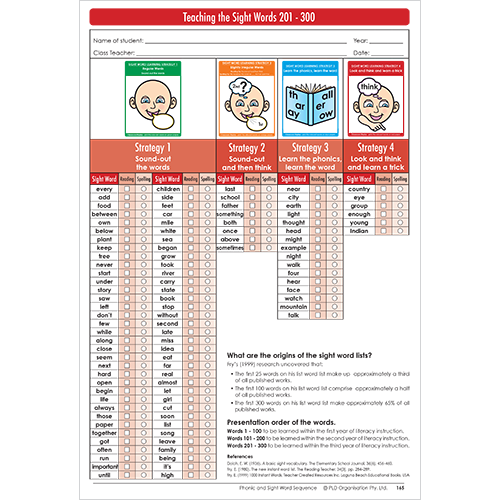 A recent DSF Bulletin article provides an overview of the evidence based Structured Synthetic Phonics (SSP) programs and how sight words are integrated within the phonics teaching. Remember Teaching sight words (or HFW) is not separate to phonics instruction. Tip #6: Move away from dated approaches to sight word teaching. No to multisensory approaches such as sand-paper and shaving cream. 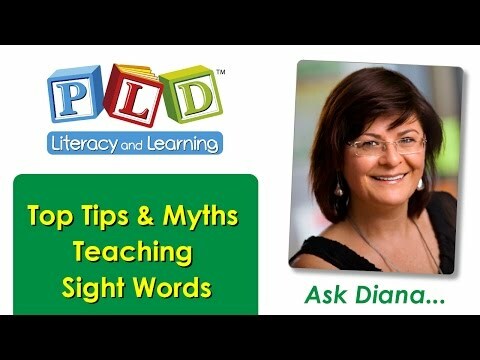 Tip # 7: The PLD approach to the explicit teaching of HFW’s or sight word teaching. PLD recommends the application of 4 explicit teaching strategies to sight words. Strategy 1 – (coloured green) the words that are regular and can be sounded out. Strategy 2 – (coloured orange) the words that can be sounded, but because they typically have one element of letter/sounded inconsistency, they sound a little odd. Strategy 3 words – (coloured blue) require the phonic concepts within these words to be explicitly taught and explained. Strategy 4 words – (coloured red) are the irregular words, that require a visual strategy such as a mnemonic, acronym etc. PLD applies these strategies to the Fry words (see download below) but also provides blank templates within the Phonic Sight Word Sequence, so that schools can apply the explicit teaching strategies to whichever school-based set of high frequency words that they are using.